WhatsApp Messenger App is now favorite messaging app of every individual using mobile devices around the world, with messaging feature WhatsApp also gives a benefit to the user to send or share videos, pictures etc. so all these bunch of features have made WhatsApp popular and most used messaging app around the globe. As WhatsApp is need of every individual using smartphones so that’s the reason some of the smartphone manufacturing companies comes with preloaded WhatsApp Messenger in its devices. When we install WhatsApp Messenger we are allowed to login with only one account or one mobile number of WhatsApp. WhatsApp doesn’t allows the user to login with multiple or two accounts simultaneously, so today we are going to solve How to use two WhatsApp in one Phone. Officially WhatsApp Messenger doesn’t allow to use two or more account logged in at one time on one device but this limitation can be removed and your need to use two WhatsApp in one phone can be easily full filled by using a small application called “SwitchMe Multiple Accounts”, you can easily download the app called SwitchMe Multiple Accounts from Google Playstore but to install this app you will need to get your Android device rooted or else you will not able to install and use the app called SwitchMe Multiple Accounts to use two WhatsApp Account in one Phone. Once SwitchMe Multiple Accounts gets installed create two profiles to use two different WhatsApp Account in one Phone. First profile which you have created will use the WhatsApp which you have installed on your phone and for second WhatsApp you will have to go to SwitchMe Multiple Accounts app and select secondary profile and in that download WhatsApp and login with another WhatsApp Account. 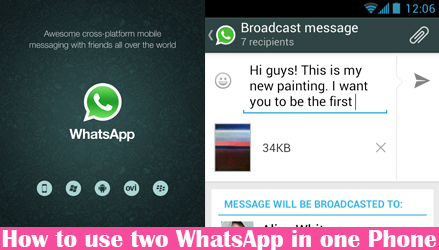 So now you can use two different WhatsApp Account or mobile number accounts on one Android phone simultaneously.